⚜️ Happy Mardi Gras! It's Fat Tuesday (Shrove Tuesday). Tomorrow is Ash Wednesday. Autocratic regimes are increasingly censoring the internet in their countries. And races to develop new internet technologies, such as blockchain and 5G, are heating up between the U.S. and China. Why it matters: The next version of the internet could be split between countries that embrace an open web and isolationists that don't. It could also be fractured by different technologies that could fundamentally change the interconnected nature of the network and limit who can do business where. What's new: India recently announced a proposal that would install a Chinese-style of internet censorship ahead of its elections. The move brings India, which has the second-largest internet population, farther from other democratic republics around the globe. Russia is considering a plan to temporarily disconnect from the internet as a way to test its cyberdefenses. Some African nations are continuing to use censorship to manipulate elections. The Democratic Republic of Congo and Nigeria, for example, have faced pressure to reduce efforts to censor or shut off the internet ahead of elections. 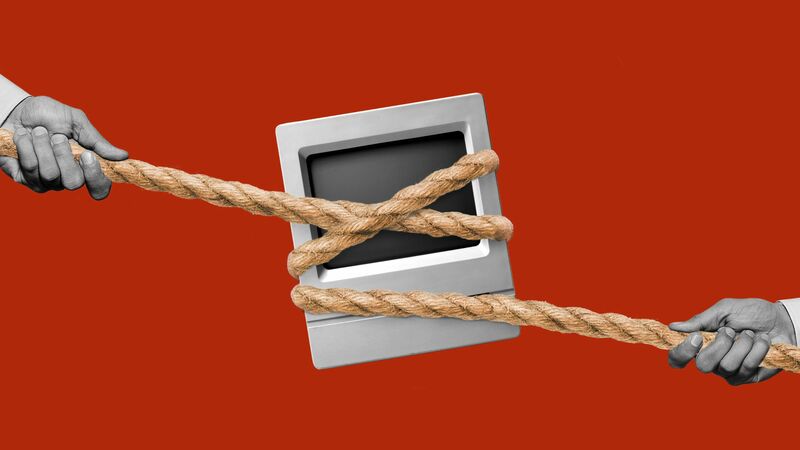 China has long used a "Great Firewall" to block access to certain sites. What's next: New technology and shifting economics will also be driving forces in how the internet develops around the world. Blockchain: Some experts see this open-source technology, which powers bitcoin, as a tool that will drive the expansion of an open web. 5G: The fifth generation of mobile connectivity will be so much faster than the current network, that experts think the first region or corporation to create an expansive 5G network will create its own version of the web. The bottom line: The internet, which for years has been perceived as the driving force for global connectivity, could one day wind up separating the world. "The president’s eldest sons, Donald Trump Jr. and Eric Trump, and his son-in-law, Jared Kushner, all received letters." 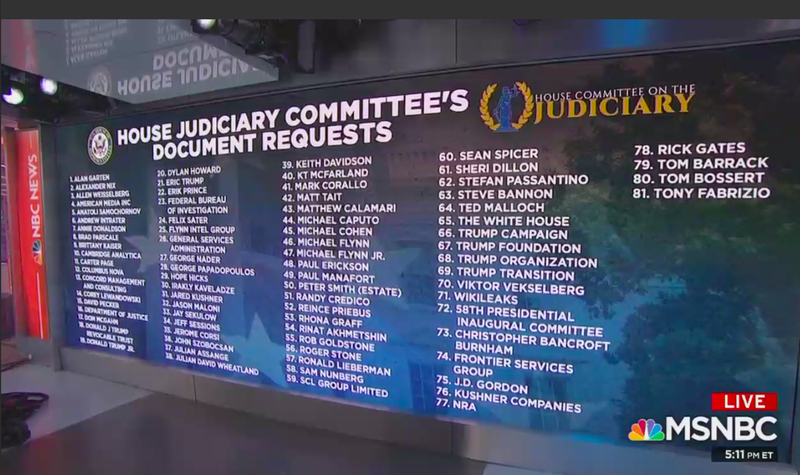 "So did Trump Organization executives, including chief accountant Allen Weisselberg and Trump’s longtime personal secretary Rhona Graff, as well as longtime Trump associates like David Pecker, the publisher of the National Enquirer." Why it matters: "The initial flood of requests adds to the escalating congressional investigations that encircle Trump’s presidency, and it’s another example of how Democrats are flexing their newfound political power." Chairman Jerrold Nadler said the committee will investigate three main areas: "Obstruction of Justice ... Public Corruption, including potential violations of the emoluments clauses of the U.S. Constitution ... and Abuses of Power." Sarah Sanders replied: "The Democrats are not after the truth, they are after the President." See the list of 81 recipients, with a link to each letter. "There’s no plausible route from here to there." "If America were a blank slate, Medicare for all would be a plausible policy, but we are not a blank slate. At this point, the easiest way to get to a single-payer system would probably be to go back to 1776 and undo that whole American Revolution thing." For 20 years, Harris Poll has been measuring the reputations of the most high-profile American companies. This year, for the first time, people mentioned the U.S. government as a "company" that they think about — and they hate it, Axios managing editor David Nather writes. 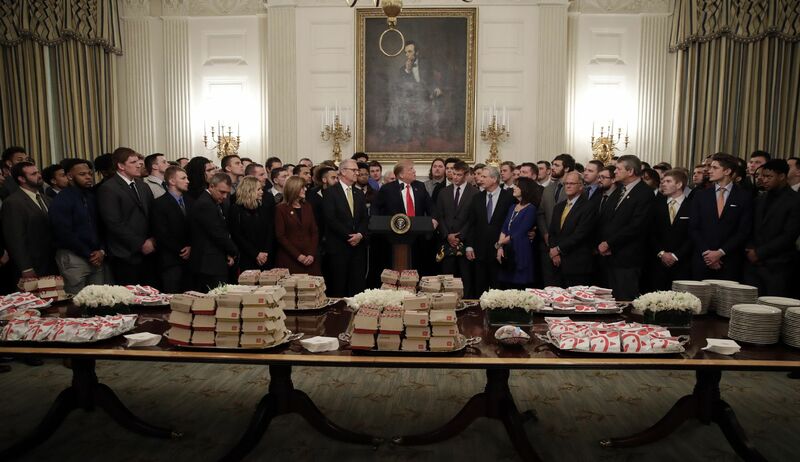 "The smell of burgers and fries wafted through the State Dining Room as President Trump celebrated the championship football players from North Dakota State with fast food, like he did when he honored the national champion Clemson Tigers" during the shutdown, AP reports. The Bison players "laughed with the president while eyeing stacks of Big Macs and Chick-fil-A sandwiches on a long table in the center of the room." "A side table was piled with bags of french fries, kept warm under a light." "[I]n the late summer of 2017, a few months before the Justice Department filed suit, Trump ordered Gary Cohn, then the director of the National Economic Council, to pressure the Justice Department to intervene. 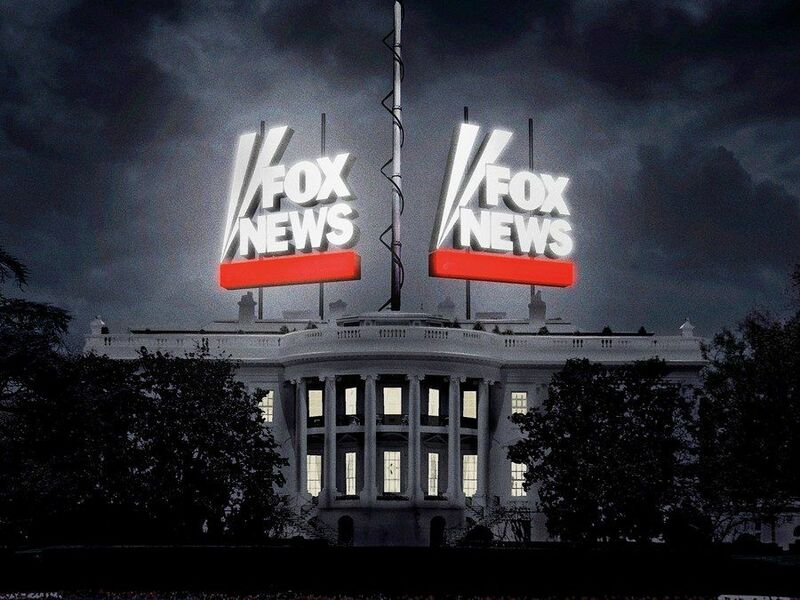 According to a well-informed source, Trump called Cohn into the Oval Office along with John Kelly, who had just become the chief of staff, and said in exasperation to Kelly, 'I’ve been telling Cohn to get this lawsuit filed and nothing’s happened! I’ve mentioned it fifty times. And nothing’s happened. I want to make sure it’s filed. I want that deal blocked!'" "Cohn, a former president of Goldman Sachs, evidently understood that it would be highly improper for a President to use the Justice Department to undermine two of the most powerful companies in the country as punishment for unfavorable news coverage, and as a reward for a competing news organization that boosted him. According to the source, as Cohn walked out of the meeting he told Kelly, 'Don’t you [effing] dare call the Justice Department. We are not going to do business that way.'" More than half of the allegations of sexual abuse of unaccompanied migrant minors by adult staff occurred in shelters run by just three contractors — nonprofits that received federal grants totaling more than $2.5 billion dollars over the past four years, according to USAspending.gov. Axios' Stef Kight and Caitlin Owens write that the federal government has received as many as 10 separate reports of alleged sexual abuse by staff at multiple migrant child shelters over the past four years, totaling 178 allegations against adult staff members, according to HHS documents given to Axios. The big picture: HHS received 4,556 complaints of sexual misconduct by minors and adults in from October 2014 to July 2018, and the Department of Justice received a total of 1,303 complaints. Why it matters: That's a "striking shift on an issue they have shied away from for the past decade." Senate Democratic Leader Chuck Schumer is "trying to turn a weakness into a strength. He is planning daily floor speeches attacking Republicans for inaction," and will propose "a special Senate committee focused on the issue." "Now we’re a decade down the road, and the road is surrounded by floods and fires in a way that is becoming more and more visible." 23 people are dead in the rural community of Beauregard, Ala. (near the Georgia line, in the same county as Auburn), and dozens are missing after the deadliest U.S. tornado since 2013, when 24 were killed in Oklahoma, AP reports. The path of destruction 24 miles long and nearly a mile wide. Most of the fatalities occurred within a square-mile. 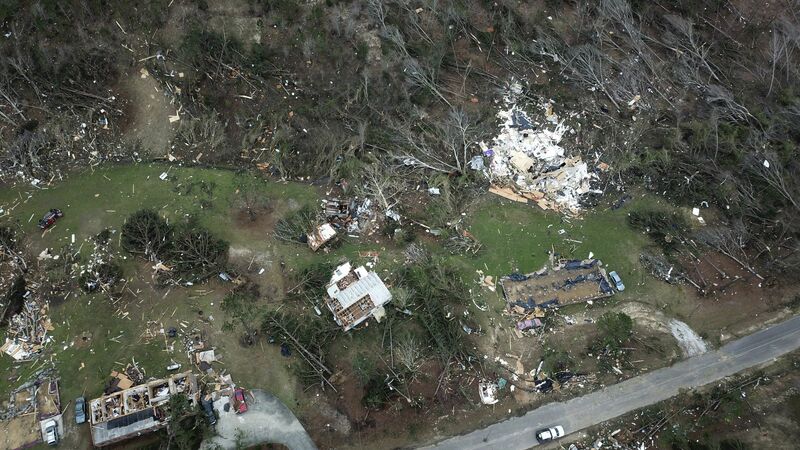 "Mobile homes tucked among tall pine trees were swept from their bases and smashed into unrecognizable piles of rubble. Toys, clothes, insulation, water heaters and pieces of metal were scattered across the hillsides where once towering pines were snapped in half." A Microsoft Corp. employee in Redmond, Wash., "showed Melania Trump how he uses technology to limit his teenagers' screen time," AP reports. "It was the second stop on her three-state overnight trip [Oklahoma yesterday and today in Vegas] to spotlight the themes of her 'Be Best' campaign: child well-being, online safety and bullying prevention, and opioid abuse." 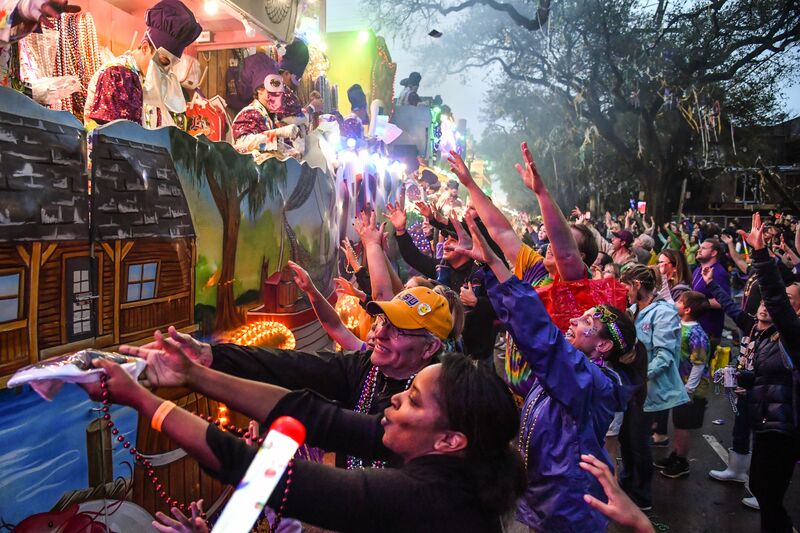 "The party officially ends at midnight, when police on horseback ride down Bourbon Street to ceremonially 'clear' the street — a symbol meant to mark the end of the Carnival season." "Wednesday marks the beginning of Lent, which for many Christians is a period of fasting and reflection ahead of Easter."